RAHIM YAR KHAN: A child died in a rain-related incident in Khanpur on Friday. It rained for more than an hour in Rahim Yar Khan and its adjoining areas. The weather paralysed routine life as most of the city was inundated by water. Rescue officials told Express News that five-year-old Aurangzeb suffered critical injuries when the roof of a house collapsed over him due to a heavy downpour in Paka Laran area in Khanpur. The injured was immediately shifted to Tehsil Headquarter Hospital for treatment, but could not survive. 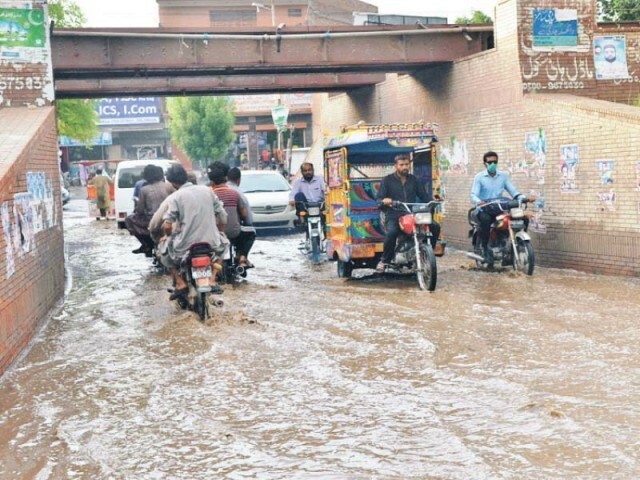 Meanwhile, heavy rains hit different cities, including Liaquatpur, Jhang and Multan. The rains turned the weather pleasant and significantly decreased the temperature. As a result of the downpour, main roads in different cities were submerged in rainwater, exposing the poor planning of civic bodies. Most of the cities and towns were also without electricity for many hours, adding to people’s miseries. As a result of intermittent rain, most of the low-lying areas were inundated, exposing the poor preparation of the district administrations. All major roads and underpasses were submerged in rainwater and sewerage. People faced severe difficulty while commuting as the district administrations failed in draining out the accumulated rainwater. Besides, rainwater also resulted in traffic jams on major roads in Rahim Yar Khan and Multan. In low lying areas, water entered houses creating difficulties for the residents. Published in The Express Tribune, August 18th, 2018.